Today is my 1-year anniversary at the Block. It’s also dangerously close to a few Block birthdays. In celebration of these monumentus events, I decided to bake a cake that (kind of) looks like our logo. Also it incorporates our odd love of oranges and it’s sitting on a wood cutting board so we get the wood obsession in there too. The cake is lovingly made with white and yellow cake, vanilla frosting, fondant and cocoa powder. 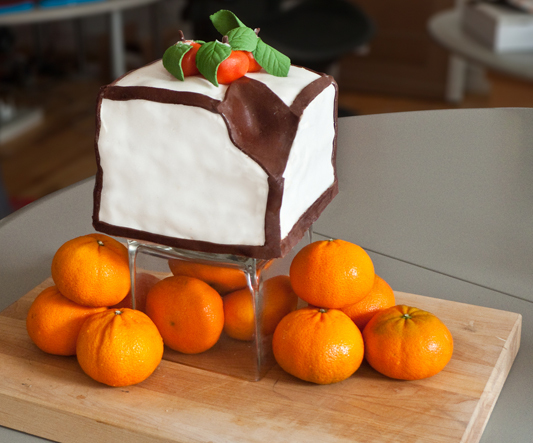 I topped it off with some marzipan oranges with sugar leaves. This is the 2nd cake I have baked for my fellow worker bees that the block. Previously I attempted to bake a wedding cake when Leo and Beatriz got married and we had a reception at the office. On a sentimental note: I am honored to have been able to work in this fantastic place for a year now. The Chopping Block is a very special, dare I say magical place that I look forward to escaping to every single day.